The bottom of the open area of the bay is primarily covered by seagrasses (Thalassia testudinum, Syringodium filiforme, Diplanthera wrightii, Ruppia maritime) macro-algae (Halimeda Punta, Avrainvillea nigricans, Acetabularia crenulata, Batophora oerstedi) and sand mounds, which are mainly created by marine worms and other bottom organisms. Seagrass communities are very important ecosystems. They provide food, shelter, breeding and nursery grounds for a variety of marine organism, and play an active role in stabilizing the sediments as well. 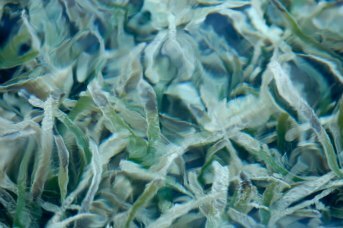 Within seagrass communities, a variety of benthic algae, phytoplankton and epiphytic algae growing on the seagrass blades can be found. Epiphytes are organisms living on the stems and leaves of seagrasses. Older leaves may be completely covered with epiphytic algae. A variety of animal species use the seagrasses as food source, like the Queen Conch (Strombus gigas), sea urchins, reef fishes, and sea turtles.